Guilt and shame are often mixed up. Guilt rides with the act. Shame degrades the value of the individual in a public or social way. Leaders of any group that opposes the powerful are shamed. Without support, they abandon their cause while internalizing that sanction. Shame silences much more than 1,000 signed gag orders. 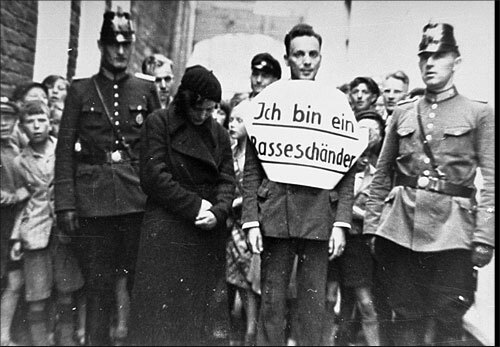 In this photograph, a young man who allegedly had illicit relations with a Jewish woman is marched through the streets for public humiliation. Flanked by German police officers, he wears a sign that reads, “I am a defiler of the race.” These events were calculated to both punish the so-called offenders and to make a public example of them as a deterrent to others who might not fully subscribe to Nazi racial theory. Norden, Germany, July 1935. This entry was posted on Wednesday, February 24th, 2010 at 12:01 pm and is filed under Outlaw gagging investors, Shame - Humiliation. You can follow any responses to this entry through the RSS 2.0 feed. You can leave a response, or trackback from your own site.